I’m not one to jump on food trends, despite having a certificate as a nutritionist, I take my time warming up to new foods. Take for instance Matcha, I’ve tried it over the years in smoothies and as lattes. But it wasn’t until a friend made Matcha cookies, that I was intrigued. 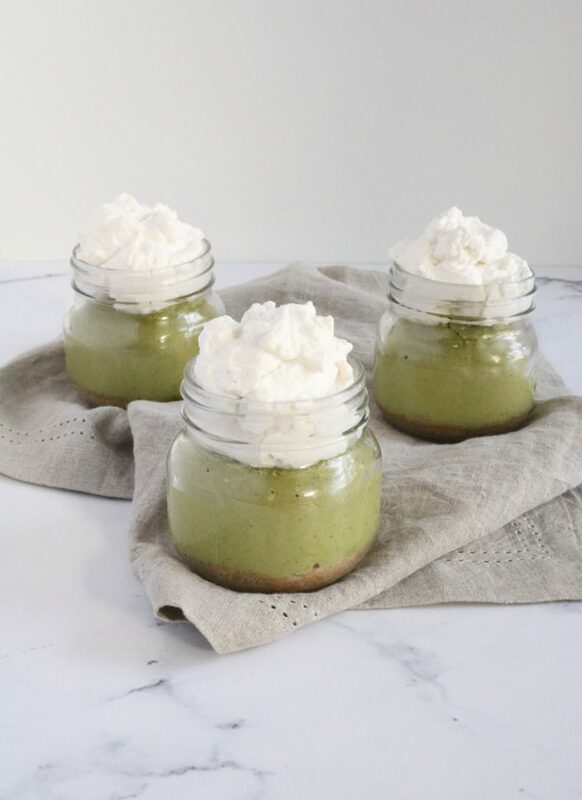 With St. Patricks Day just around the corner, I thought what better time to explore baking with Matcha than now, it just happens to be the perfect colour! 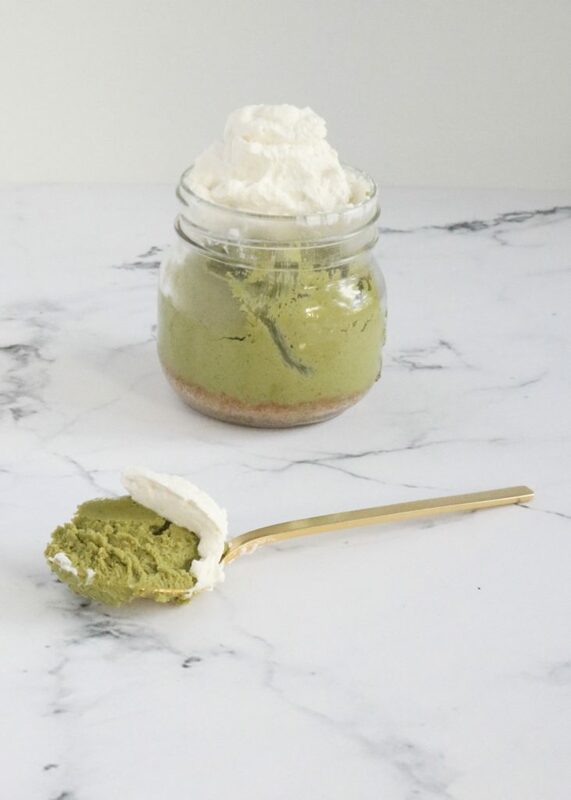 Which brings me to today’s recipe, a Matcha Cheesecake. Thankfully they did turn out! And I can’t wait to make these for our St. Patrick’s Day celebrations. 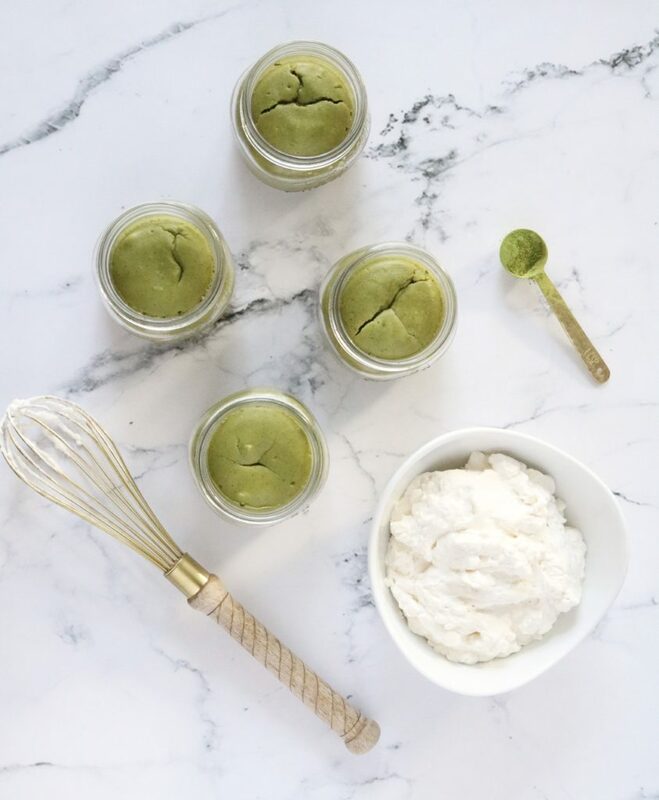 Have you baked with Matcha? If so, I’d love to know what you made. Spray 4-6 small mason jars with non-stick cooking spray, be sure to spray the bottoms so the crust doesn’t stick. In a food processor blend the graham crackers until you have fine crumbs. Add melted butter and 1 tablespoon of sugar and continue to process until the crumbs at to stick to themselves. Place 2 tablespoon of the crumbs into each mason jar and press down to make the crust. In a large mixer bowl, mix the room temperature cream cheese with remaining sugar until smooth. Add the eggs and mix well. Add the Matcha powder and 1 teaspoon of vanilla and mix until well incorporated. Fill each mason jar to the treads, leaving room at the top for your topping. Place the jars in a large roasting pan. Fill the pan with hot water halfway up the mason jars. Place in the oven and bake for 30 minutes. Remove jars with tongs and place on a wire rack to cool. While the cheesecakes cool, beat whipping cream in a chilled bowl until stiff peaks form. Add the sugar and remaining vanilla and beat until incorporated. When the cheesecakes are cool, top with whip cream and enjoy!